Dr. Paul Perrine knew from an early age that he wanted to be a dentist, following in his father and sister’s footsteps. Through high school and undergraduate college, he worked for and shadowed his father to get a jump-start on his dental knowledge. He attended West Virginia University and received his B.S. in Animal and Nutritional Sciences in 2010. In 2014, he graduated from West Virginia University School of Dentistry, earning his Doctorate of Dental Surgery. Upon graduation, he practiced for two years with his father and sister at Perrine Family Implant and Aesthetic Dentistry in Cowen, WV. He also practiced with Dr. Mike Moore and Dr. Michelle Brown at Oceana Dental Center in Oceana WV, for two years. 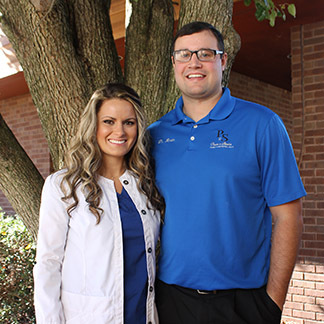 In 2016, he married Dr. Ashton Staunton and together they bought their practice, Perrine and Staunton Family Dentistry, the former Layne and Myers. Dr. Perrine performs all types of procedures such as restorations, fixed and removable prosthodontics, extractions, restoring implants, teeth whitening, and pediatric dentistry. “I love to be able to help patients become pain free and most of all prevent patients from having pain.” He is very proud to give patients a healthy and beautiful dentition. Dr. Perrine was born and raised in Cowen, WV. He and his wife, Dr. Staunton, have one son Aiden. He is a big Mountaineer fan, and enjoys all sports. He is an outdoor enthusiast where he enjoys hunting and fishing. His favorite thing above all is to spend time with his family. If you are looking for a new dentist, Dr. Perrine would love to meet you, get to know you, and become your new dental provider.